Jim was born in Coventry in 1955 and studied drumming for five years at the Coventry School of Music http://www.coventrycorpsofdrums.org.uk before embarking on commercial ventures at the age of fifteen. In 1970 he appeared at The Royal Albert Hall in London as a percussionist in the highest level of the finals of the World Brass Band Championships. It was suggested at the time that he was probably the youngest percussionist to have ever appeared at that level of competition. Jim again played at the Royal Albert Hall in the 90's. During his playing career he has performed in many genres of music from Marching Band to Brass Bands to Rock Bands to Big Band Jazz and most things in between. Jim has worked in theatres, cabaret clubs, seaside shows, open air stadium concerts, live and pre recorded radio broadcasts as well as freelance recording session work at studios in London, Coventry and the West Country. He has played for many t.v. personalities appearing at live shows in the South West and has been the 1st choice drummer for leading Westcountry Jazz Big Band "A.J. 's BIG BAND" since 1990 http://www.ajsbigband.co.uk , playing on four albums with the band, the latest released in March 2006. Jim regularly appears at venues across the South and West of England with the Big Band and others. Jim has taught drumming since he was eighteen. He turned it into a professional career in the autumn of 1989. Apart from his Exeter and Exmouth studios, he also teaches at a leading independent school in Somerset where he has been the tutor of drum kit since 1989. Many new pupils are referred to him by local drummers, music teachers, present and former pupils. Jim has taught the children of many established semi professional drummers, other professional musicians and music teachers, as well as teaching drumming to other music teachers themselves. In 1994 he began writing a series of tutor books named "The Mere Mortals Guide To Drumming". The tutor books now consist of four levels (plus a double pedals book) and all pupils are taught from these books. Pupils who succesfully reach the end of Level Four, often go on to take Grade 8 national examinations. As detailed above, Jims pupils have consistantly achieved "merit", "honours" and "high honours" passes in national music examinations right up to grade 8 "passed with high honours". 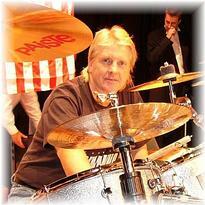 Former pupil Mark Pusey is now a leading London session drummer with many t.v. appearances to his credit. A 15 year old pupil also won through to the final stages of the "U.K. Young Drummer of the Year Competition".